When the star-studded “opening” party of Fring’s made its way into the media in late September, news of the Drake and Lee collaboration swept the foodie scene by storm. There were tons of photos of the Toronto rapper, Susur, Kai, Levi and even Jada Pinkett-Smith … just no shots of the food itself. In fact, in all the coverage, the menu was under wraps; who knows if the burger, salmon tartare and fries served at the party was even on it? Fast forward a month and the restaurant actually opens. The spacious two floor establishment is dark and has a modern cabin vibe. If you look carefully, you’ll get a glimpse of it right after leaving the entrance: a short hallway before the dining room showcases stuffed birds behind metal panels. When you sit down, you may even feel it: from the soft chairs adorned with horse hair. Nonetheless, the woodsy lounge atmosphere still doesn’t describe their menu. After perusing through the one pager, I can best sum it up as “diverse”. Salmon crudo comingles with mom’s homemade meatballs and there’s rigatoni, steak or fried chicken. To start, there’s even a whole section dedicated to toast; the crispy carb adorned with mushroom, meats, cheeses or avocado. 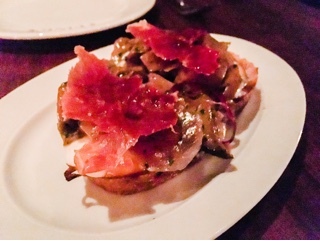 The wild mushroom and prosciutto toast ($10) had a generous toppings to bread ratio: the soft crunchy toast smothered with gouda and crème fraiche, plump meaty mushrooms and slices of dry cured prosciutto. It’s a delicious combination: some briny bite from the meat, juicy caramelized mushrooms and then an unexpected rich creamy finish. My favourite dish of the evening was the grilled wild king prawns ($29). 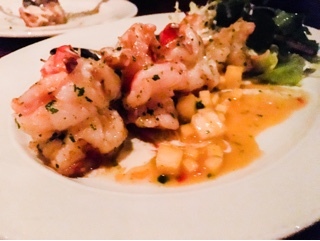 The humungous butterflied prawns were fleshy and sweet, there was a Creole influence with the spicy pineapple mango salsa and beurre blanc sauce. Butter and shrimp go so well together, but then it’s elevated with a tangy sweet salsa, which ends with a twinge of heat. 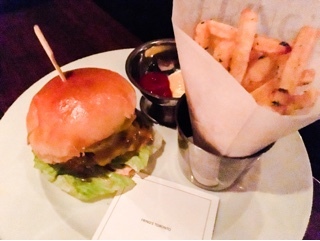 When a chef names a burger after themselves, it makes me want to try it. 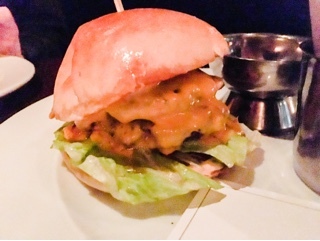 The Susur burger ($20) follows the trend of making a better “Big Mac”. Two rich beef patties are cooked medium and smothered in enough cheddar cheese to make mice rejoice. It’s all finished off with crisp lettuce, a Thousand Island type mayonnaise and a soft egg bun. It’s good, but unless Susur loves McDonalds, I can’t decipher the connection to him. There wasn’t an ounce of his famed Asian or European influences, except maybe the dusting of rosemary that covers the hot and crispy Jamie Kennedy fries. 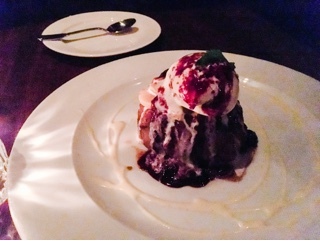 With only four dessert options, the caramel monkey bread ($14) holds the most interest. This pull apart cinnamon bun with caramelized apple slices, hazelnut ice cream and drizzles of English cream & salted caramel is heavenly. Just be sure to share as it’s fairly sweet and decadent. Fring’s menu probably best embodies Toronto. We’re a city that has a diverse food offering, which most dwellers try regularly. Here is a restaurant that allows you to eat different cultural dishes simultaneously. 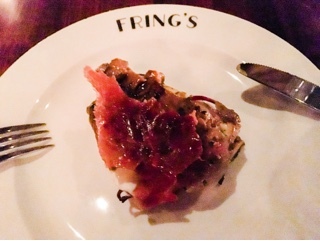 Visiting during the third week Fring’s opened, I found the service a little off. Everyone was friendly and our drinks well looked after, but the key transition points during the meal were missed. After our mains and dessert, the empty dishes languished for almost half an hour before they were finally removed. We were actually considering stacking the dishes in the centre to make it more obvious. In the end, there’s a long lag between dessert and getting the bill, causing our low-key Wednesday dinner to become a 3-hour affair. Perhaps, it was because by the end I just wanted to leave. Unknown to me, Wednesday is also live band night. Don’t get me wrong, they were good. But, there are times when I want to listen to music and others when I’d rather converse with a friend. Little did I know, that eating on Wednesday meant finishing off the meal at a concert (tip: ask to be sat in the depths of the bar section, it’s further from the music). It’s inevitable, Fring’s will be a boozy hip lounge where conversing is difficult: after all, it’s on King West and Drake needs a place to lounge with his possé. Thankfully, it’s not all about the atmosphere, the restaurant also serves up some great food! You just won’t be able to tell your companion how impressed you are after 9pm.